A state memorial service for cricketer Phillip Hughes has been cancelled. Australia batsman Hughes, 25, died in hospital two days after being struck by a ball in a domestic game last month. New South Wales Premier Mike Baird said the decision followed consultation with Cricket Australia and Hughes's family. He added: "All parties felt that given the enormous outpouring of support at last Wednesday's funeral, a state memorial service would no longer need to be held." About 5,000 people attended the service in Hughes's home town of Macksville, New South Wales, with mourners including Australia's Test team, coach Darren Lehmann and cricket legends Shane Warne and Brian Lara. 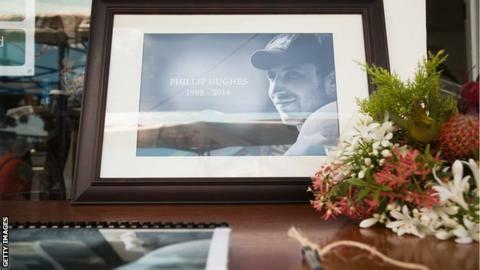 "Last Wednesday's funeral in Macksville was a wonderful service and a fitting tribute to Phillip's life," said Baird. "It was a community event attended by thousands of people, watched live by millions of Australians and observed at a number of grounds around the country, including the Sydney Cricket Ground." Former Hampshire, Middlesex and Worcestershire batsman Hughes was representing South Australia against New South Wales in a domestic Sheffield Shield match when he was hit by a Sean Abbott bouncer. Hughes had been wearing a helmet but the ball struck him at the top of the neck, causing the injury. Australia's Test series against India was due to begin in Brisbane on 4 December, but that was rearranged due to the proximity to Hughes's funeral. The rescheduled first test begins on Tuesday in Adelaide.